This Monday, as I sat down for dinner to complete my weekly ritual of watching the Downton Abbey episode from the night before, I thought back on the show, it’s successes and failures, and one of its most unfortunate casualties. Sweet Isis, the beloved family Labrador named after the Egyptian Goddess, who was ‘killed off’ the show when the terrorist group began to make headlines. While I won’t get into the politics of the decision, what is important to acknowledge is that Downton Abbey has a connection to Ancient Egypt that goes far beyond the name of the Crawley family’s unfortunate hound. Highclere Castle, home to the fictional Crawley family, was (and is) the real-life abode of the Herbert family, the Earls of Carnarvon. The Herberts include in their ranks a man who was involved in the discovery of one of the greatest Egyptian treasures—the tomb of King Tutankhamen. In 1922, the fifth earl of Carnarvon sponsored archaeologist and friend Howard Carter in his exploration of the Valley of the Kings, never imagining they would uncover the final resting place of one of the most illustrious Egyptian pharaohs in Egypt’s history. George Herbert, Fifth Earl of Carnarvon, first travelled to Egypt in 1898. From 1906 on he spent many winters in Egypt, and collected numerous artifacts 16 years spent near Luxor in the Valley of the Queens, the Valley of the Nobles, the Valley of the Kings, and in the Nile Delta near Alexandria. His collection served as a trophy of his great adventures, but upon his death in 1923, his widow was forced to part with it to pay for death costs. After being catalogued by Howard Carter, the collection was sold to the Metropolitan Museum of Art with Carter leaving the “unimportant, less impressive” artifacts at Highclere. Fast forward almost 70 years, and these “less impressive” artifacts reemerge when an aged butler reveals a secret panel covering a cache hidden in the walls of one of the estate’s lesser-used rooms. Behind these panels were scarabs and wood pieces, even a minature axe head was discovered stuck to the windowsill. Egyptologist Nicholas Reeves agrees that the found objects are “less impressive” than other Carnarvon artifacts, Reeves believes they hold importance elsewhere. In fact, they are the only known group excavated from the tomb of Amenhotep III. Now some of these 300 Egyptian pieces from excavations of various sites at Thebes and Tel Balamun, are on exhibit as well as the castle’s Reynolds and Van Dyck paintings, French furniture and beautifully renovated, silk-lined rooms. As I watched this week’s episode, it was an emotional rollercoaster (It’s the final season…I’m not handling it well,) but nothing brought more joy that when Robert received a gift from the Dowager Countess, Queen Maggie Smith. Ahhhh…that blissful moment when they actually get the history right. Thank you, Downton Abbey writers, thank you. In June, the social media world began buzzing when a time-lapse video from the Manchester Museum in Manchester England was released, depicting an Ancient Egyptian statue physically rotating on its own. 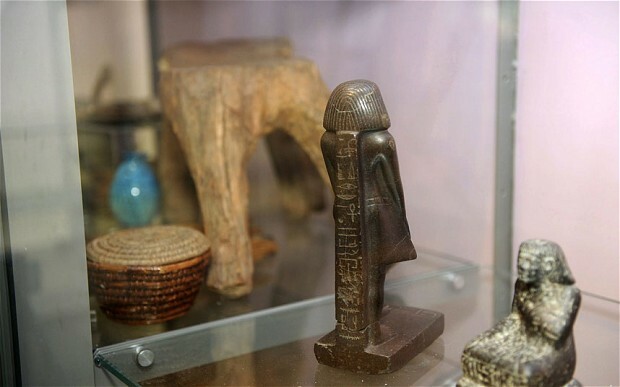 The statuette was donated to the museum in 1933 by Annie Barlow, a mill owner from Bolton who sponsored archaeological digs in the great era of discovery—King Tut’s tomb being discovered only a decade earlier by Howard Carter. Nothing is known about the specific tomb that the statuette came from, but by examining the figurine’s hieroglyphic inscriptions, it is possible to decipher a few bits of information about the tomb’s owner. From the statue’s shoulder-length wig and knee-length civil-service kilt, it is gauged that the tomb owner, named Neb-Senu, was a senior civil servant. Little is known about Neb-Senu other than that he was a man of means, given the quality of the 10 inch tall serpentine statuette created as a place for his ka, or spirit, to live when his body had passed into the afterlife. Neb-Senu is thought to have died around 1800 BC, and the inscription requests offerings of beer, beef, and a fowl—a standard prayer in Ancient Egyptian funerary texts. 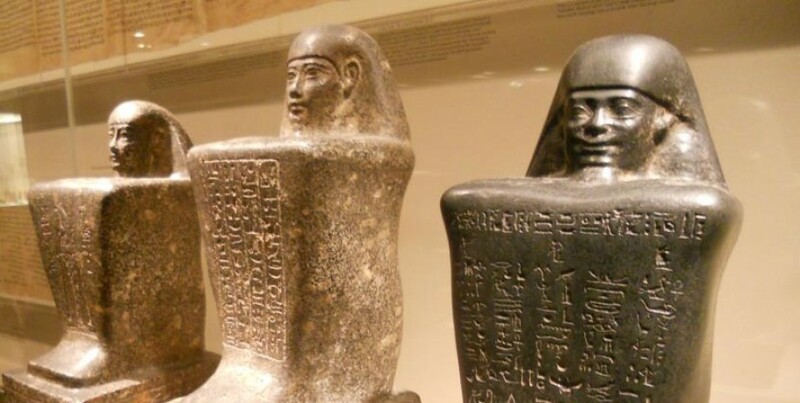 The statue has been housed at the Manchester Museum for 80 years, and was brought to the global stage after Campbell Price, the curator of the Egyptian Artifacts at the institution, noticed that the statue had been moved from its original position. This continued for multiple days, sparking the interest of Price. In order to formally investigate, he returned the statuette to its original position in a locked glass case and set up a camera to film the time-lapse video that has since become an internet sensation. Scientists have taken many different approaches to explaining the self-spinning statue. Some attribute the movement to the vibrations in the room caused by foot traffic, due the revelation that the statuette only moved during the day, when visitors were present. Other experts claim that “differential friction” is the culprit, but even then, some kind of force must be exerted on the statue for it to move. In fact, all of the scientific explanations have major flaws. For example, on one occasion, the statue moved 45 degrees in 90 minutes when there were no visitors or staff members in the chamber. And, even more oddly, the statue has rotated in a perfect circle without “wobbling off” in any other direction while none of the other statues in the case, most notably on the same shelf, have shifted at all. Other possible explanations state that it is simply the individual placement and character of the statue itself, that a magnetic force is working on the figure, or that the spirit of Neb-Senu himself has returned to his ka statue and waiting for offerings to be brought. Unfortunately, the spinning of the Neb-Senu statue may remain a mystery for all eternity due to museum renovators being forced to move the case from its current location. But before they do, perhaps someone should give Neb-Senu the beer he’s been requesting for over 2000 years?